Butter is delicious. Butter also so simple to make you can whip up a batch in an afternoon. I recently enjoyed a day at The Milk Shanty, learning to milk a cow, as well as make butter and cheese. Now when I see butter I think, "Store-bought Butter? But I could make that better." Nearly everything is better when homemade from fresh, unprocessed, simple ingredients. 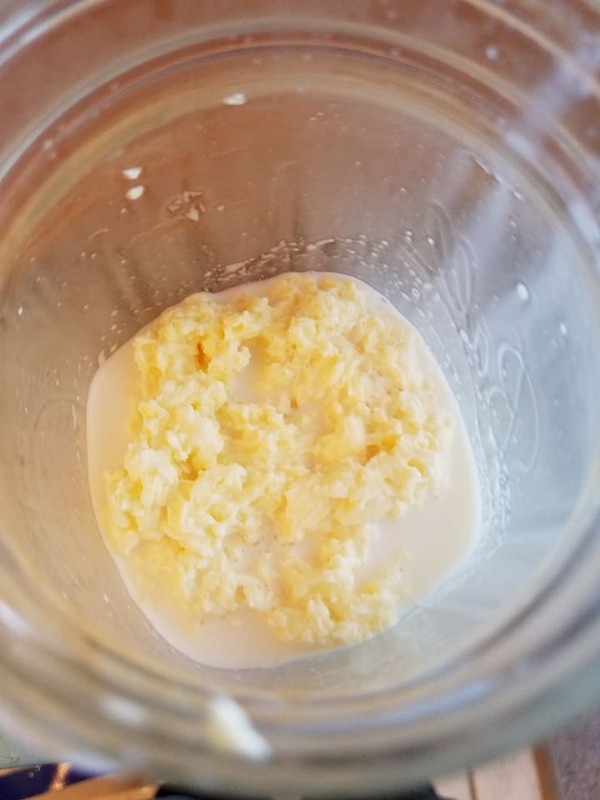 Since it's always easy to make it perfectly when the teacher is standing right there, I then went home and tried my hand at making butter and tasting the final product. I expect much more homemade butter in my future. Step 1: Shake the cream. Get whipping cream or heavy cream. This is the cream that is on top when you have raw milk. Place cream in a large mason jar and start to shake the jar. 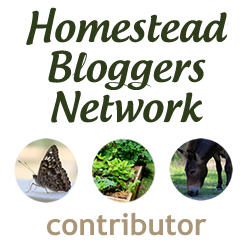 I use the standard quart sized Ball mason jars, any bigger and they would be hard to hold. If you are using raw milk, use a stainless steel turkey baster to remove the cream from the top of the milk. Try to move the baster around while sucking up the cream to prevent the baster from sucking a tunnel through the cream and grabbing milk too. As you shake the jar, the cream will start to look like a whipped milkshake with air bubbles. After 20-30 minutes the fat in the cream will clump together through the agitation, the clumping will happen all at once. One moment you will have cream, the next...thump, butter in buttermilk. The fat will clump faster if the milk is at room temperature than if it is cold. Mix the cream in a stand mixer. This will take approximately 20 minutes but 20 minutes you are doing other things while the cream turns first to whipped cream then to butter floating in buttermilk. I have a Sunbeam stand mixer which is a cheaper but competent version of your standard Kitchenaide mixer. Step 2: Remove the butter ball, and save buttermilk. Once the butter has solidified and is surrounded by buttermilk. Drain off the buttermilk and save it for buttermilk pancakes, or buttermilk biscuits. Amie at the Milk Shanty said she uses buttermilk for healing infections on animals and reviving sick chickens besides cooking with it. If you skimmed your cream off raw milk, you could add the buttermilk back to the milk to restore some of the volume and flavor. You will want to remove excess buttermilk to get a solid butter stick. Using cold water, rinse the butter to remove excess buttermilk. Press the butter ball between your hands and squeeze out the extra buttermilk. Dip the butter in cold water to prevent it melting in your hands. The cold water will become cloudy as you press buttermilk from the butter. Change the cold water as needed, until the water coming from the butter is mostly clear. Use butter paddles to press the butter between the two paddles and remove the excess buttermilk and water. To me, it seems more work than it's worth, but others may debate this. 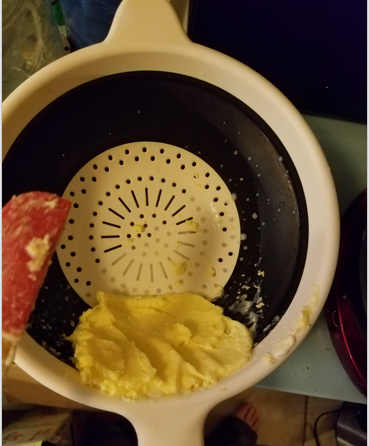 To use, press the butter between the two paddles then scrap the butter back together into a ball in the center and press again. Repeating the reform and press motion until there is little liquid left. The advantage is you don't have to handle the butter or risk melting it from the heat of your hands. I had never heard of butter paddles until I took the butter making class so here's a link to what I am talking about. Pour the butter and buttermilk into a strainer. Drain out the buttermilk. With a spatula press the butter to the side and watch the excess buttermilk come out. Spread the butter, press and fold it over itself. With this method, you don't have to touch the butter. (No slimy fingers!) You can save all the buttermilk and don't introduce more water into the butter. This is my new preferred method of making butter. Step 4: Add salt if desired. Fold the salt into the butter if you want salted butter. The salt will also help to preserve the butter and extend it's shelf life. At this point you could also add any other fun, tasty extras like garlic, jams, herbs or spices to your butter. Step 5: Store your butter or enjoy right away. The butter will be pretty soft at this point, press it into a mold or simply place it in a container for storage. Some people store their butter in the refrigerator while others leave it on the counter in a butter crock or ceramic dish. While grandma may have left butter out on the counter, there are a few concerns about food safety and I found it difficult to find hard sources on this debate. I could not find an FDA site page that listed where they recommend leaving butter at room temperature or not. I did find an article on Gizmodo.com that claims the FDA approves leaving butter out, but I can't find the science behind this and it doesn't make a distinction between pasteurized or raw. 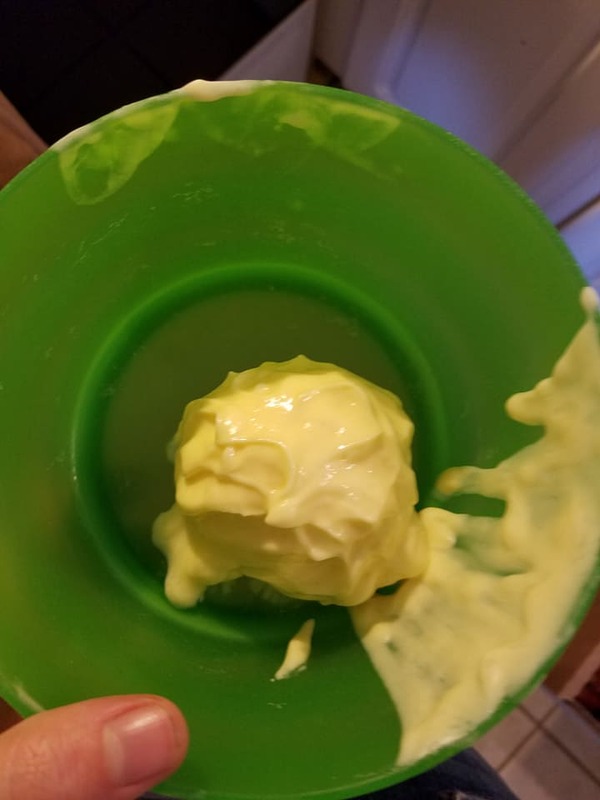 StateFoodSafety.com states that pasteurized butter can be left on the counter but raw butter should not. As for me, I will refrigerate my butter for now as it is raw and continue to search for some science on the issue. From cream to butter in 5 easy steps: Shake the cream, drain the buttermilk, rinse the butter, add salt, and enjoy! Simple and done. 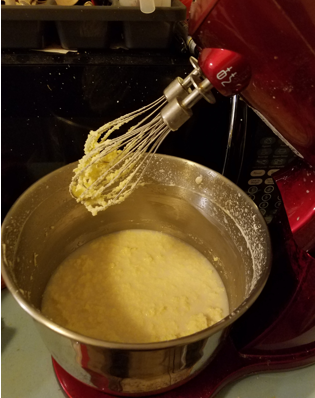 Yields: From 14 oz of cream, I got 10 oz of buttermilk and approximately 3.5 ounces of butter (a little under a stick). Add your thoughts: Do you refrigerate butter or leave it on the counter? Be sure to mention if you have pasteurized or raw butter. I tend to procrastinate quite a bit, until I am really pressed to finish the task. I bet there are a few things you are procrastinating doing, whether because they are boring or just not fun! But some things shouldn't be put off, and may be hurting your preparedness status. Are you procrastinating any of these 10 things? #1 Go to the dentist. I don't really know anyone who likes to go to the dentist, but they can spot and address health problems before they before serious. Also, if you have dental insurance and cleanings are free this also means a free toothbrush and toothpaste every month. My dentist often has a bowl of free toothpaste on the counter, and I snag some for my 72-hr bag or for traveling in my carry-on. #2 Get an oil change. While I don't expect to ever need to leave the country unexpectedly, a passport is accepted as formal ID in all states. This universal ID could be handy and can take some time to receive. Start the process and a world of opportunity opens to you. 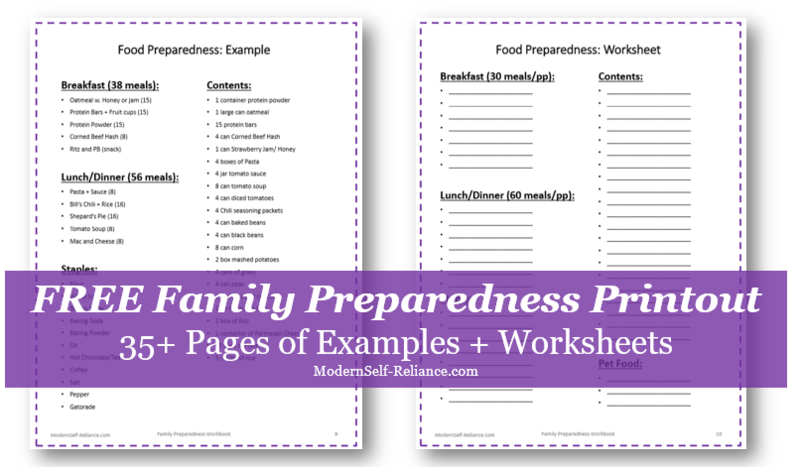 #4 Collect all family information in one place. I understand this is a real hassle to gather medical records, birth certificates, Social security cards, telephone numbers, drivers licenses and many other documents. But making copies and backing up the information could be a real time and life saver if the originals are lost. #5 Change your driver's license address to match your real address. This may be more for folks who move often, but legally your address on your driver's license doesn't have to be changed when you move residences. However this means, that when someone needs to identity you from your ID they will have an outdated address to reference. Hopefully you can do this online, because even I don't want to go to the DMV more than necessary. #6 Check your fridge for expired goods. Not really fun, finding the old science experiments in the back of the fridge. But this is space you could be using to store other, better things. Also, if the power goes out these already spoiled items will soon experience a growth explosion and probably smell really bad. #7 Check your freezer for mystery items. Also not super fun, cleaning out the freezer. While a full freezer runs more efficiently, if you can't fit the items you want or don't know whats in your freezer then your life is not running more efficiently. Remind yourself whats in your freezer, what can go and what you may want to eat soon. #8 Clean the dryer vent or chimney or other oddball item. There is probably some forgotten place you don't clean very often. For example, the dry vent can have clogged lint which could reduce dyer efficiency and maybe ignite. For those with fireplaces or wood-stoves, when is the last time you cleaned your chimney or stovepipe? There could be dangerous buildup inside the pipe that could catch fire or cause smoke to back up into your home. A clean chimney is a safe chimney. #9 Take a first aid class. 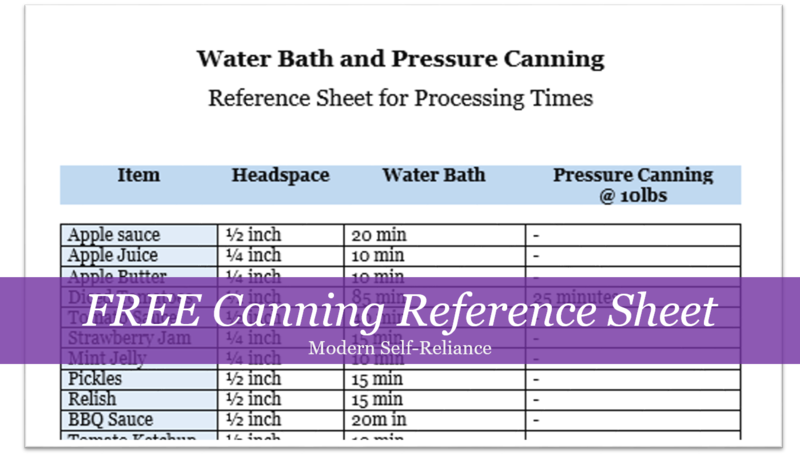 Basic know-how for handling small cuts, burns, and stabilizing patients. A first aid course is handy, no one is denying that. But when it comes to procrastinating, this one is probably falling to the bottom of your prepping to do list. American Red Cross. Don't get so caught up in the day to day living that you forget to keep learning. Whether it is a real dead-tree book, or an electronic book or articles online. Continuing to learn is sometimes forgotten but should never be overlooked. It keeps your mind active and healthy. Learning new hobbies can also reduce stress and potentially gain you a new survival skills like woodworking or fishing. What are you procrastinating doing that you really should do? Let us know in the comments section below! Thanks for reading, now go tackle your to-do list! Peeling tomatoes to make into pasta sauce can be messy business. 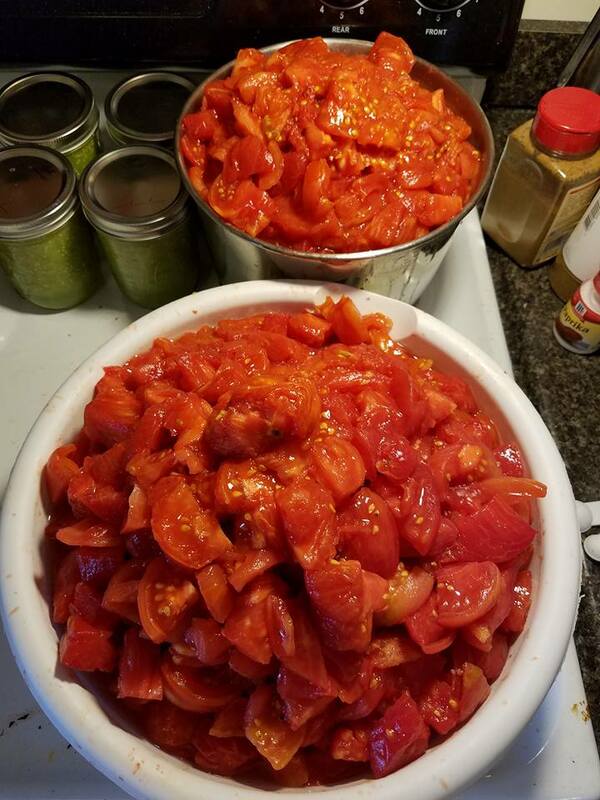 Last year I peeled and stewed over 150 lbs of tomatoes from my garden into tomato sauce. Some of those tomatoes went into pasta sauce, others I made into salsa or left as diced tomatoes. I have experimented with removing the skins and will share my method for peeling tomatoes. The common practice for tomatoes is to first dip the tomato in hot boiling water, then into an ice bath to cool the tomato off and allow you to be able to handle it. From there, the skin can be peeled. I have to keep an eye on the tomatoes in the boiling water so they don't completely break their skins in the hot water and over cook. I have to constantly add more ice to my ice bath as the hot tomatoes melted them quickly. I still end up having to handle hot tomatoes, while peeling the skins between watching the boiling tomatoes and adding ice. I found a better solution that works for me, and can be accomplished by only 1 person. No extra helpers needed (in case you don't have friends or family who want to peel tomatoes all day). Keep the water in the warm pot just below a simmer. When you add the tomatoes they will require longer in the pot than if the water was hot. But this is fine with me. It gives you more time to do other things, and gives you more leeway if you get distracted. I recommend adding only 3 tomatoes or so at a time, and letting them sit in the warm water for 2-3 minutes. You may see the skins start to peel away, and this means they are ready to come out. Although, you may have to pierce the skin, before it peels away. How to transfer hot tomatoes: Jar lifter! I have tried using tongs to grip the tomatoes but I found I sometimes mushed the tomatoes and dropped them. 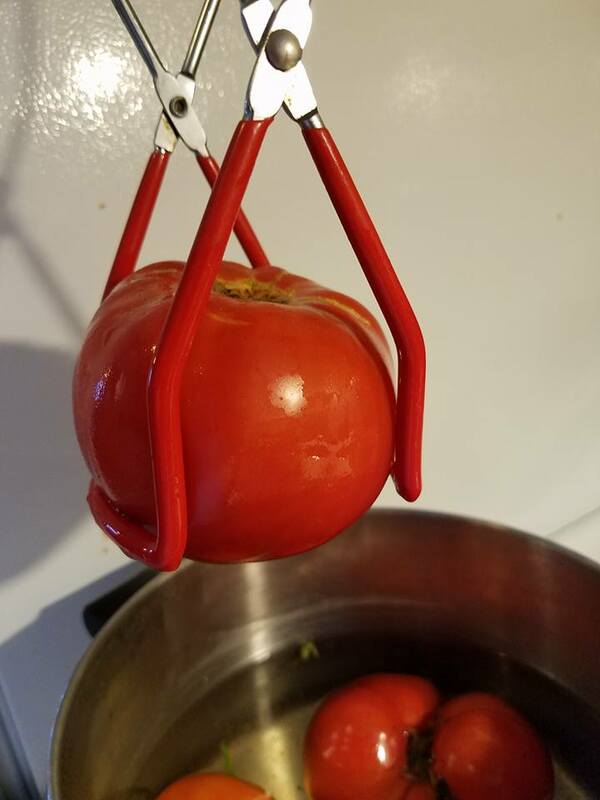 The best method I found was to use my handy jar lifter from my canning kit seen here to lift the tomatoes from the bottom. The tomatoes get a safe ride from warm water to cold in this cradle. When your tomatoes are starting to peel their skins off in the warm water, move them to the cool water. This slows the cooking process and cools the tomatoes down so you can handle them easier. As the boiling water was not super hot, the tomatoes aren't super hot, so my ice doesn't melt as quickly. I add more ice every hour or so, when the tomatoes coming from the ice bath are still too hot to handle for my liking. There is no secret sauce here. The skins should peel off nicely, if the tomato is ripe. The process of warm water will separate the skin from the flesh nicely, so hopefully you can slip off the skins. I recommend 3 tomatoes in each stage at a time. 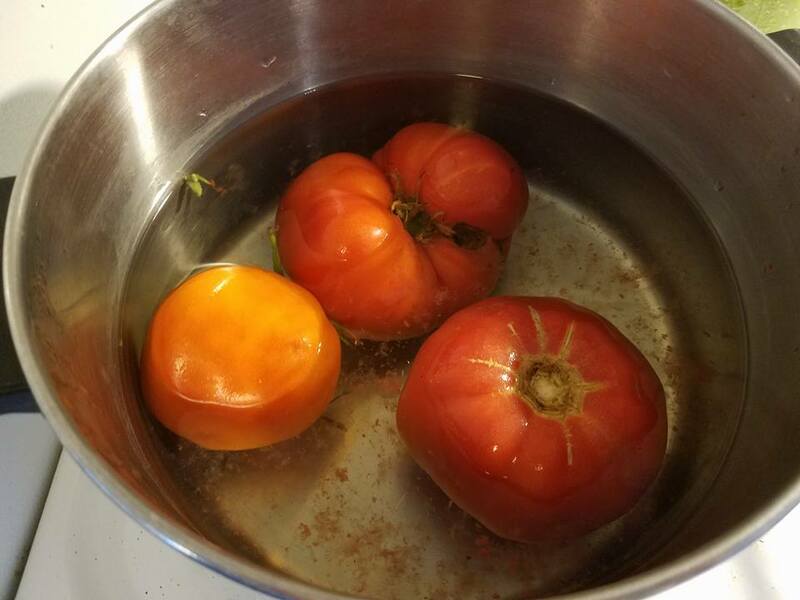 I have found, I can peel and dice 3 large Brandywine tomatoes in the same amount of time is takes 3 tomatoes to start to burst their skins in the warm water. So I have 3 tomatoes in warm water, 3 tomatoes in ice water and 3 tomatoes on the cutting board to be skinned and chopped. When I finish peeling and chopping, the tomatoes in ice move to the cutting board. The warm tomatoes move to ice and 3 new tomatoes move into the warm water. A steady flow, no juggling hot tomatoes! I hope you will learn from my burned fingers from handling hot tomatoes and will turn down the heat to warm. If you have your own system for peeling pounds of tomatoes please leave it in the comments section below.